Is Facebook Co-Founder and CEO Mark Zuckerberg losing some of his appeal? After receiving the No. 1 ranking on the 2013 list of highest-rated CEOs by social jobs and career community Glassdoor, Zuckerberg slipped to No. 9 overall and No. 4 among tech company leaders in the 2014 edition, which was released Friday. Zuckerberg still posted an approval rating of 93 percent, but that figure was 99 percent last year. The standings were tallied using CEO approval ratings from Glassdoor-approved company reviews submitted from Feb. 1, 2013, through Jan. 31, 2014, and CEOs at large companies had to receive at least 100 reviews for inclusion. Craig Jelinek, Costco Wholesale, 95 percent. Zuckerberg finished fourth on the list of tech CEOs, behind Weiner, Jacobs, and Brad Smith of Intuit (94 percent approval rating). Of course the perks are great, but the most important perk is working for a company I truly believe in. Mark is an incredible leader who wants to make the world a better place, and I love doing work for a mission I care about. We find on Glassdoor that a strong leader is often one who has the ability to clearly communicate the vision for the company and who helps employees see how their work connects to the big picture. In addition, top-rated CEOs are commonly seen as relatable, accessible, and transparent. 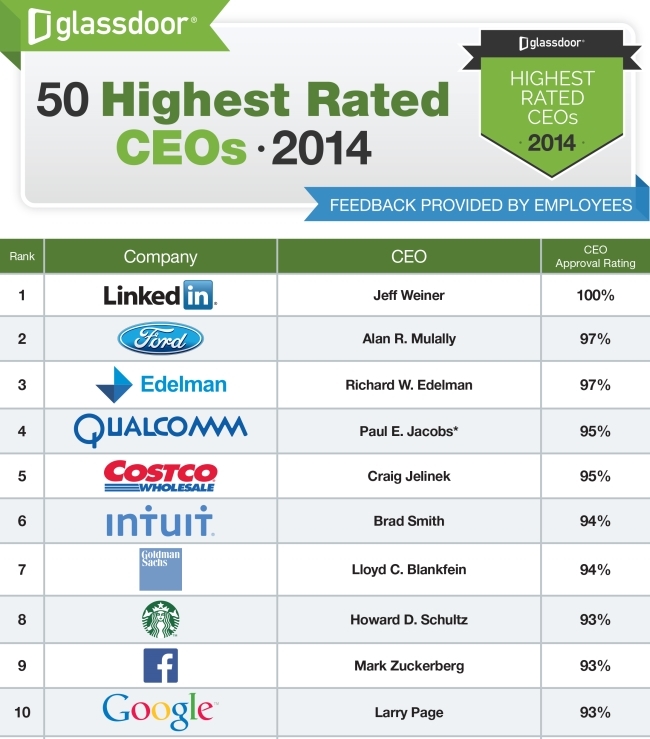 I offer my sincerest congratulations to all CEOs recognized on the 2014 Glassdoor report. It is no small feat to gain the support of your employees for your leadership. Readers: Not that a 93 percent approval rating is shabby, but why do you think Zuckerberg slipped in Glassdoor’s 2014 ratings compared with its 2013 list? Photo of Zuckerberg courtesy of Courtney Rundles.